Auto and stadium gates open Tuesday at 10 a.m., which is also when Opening Day pregame entertainment throughout the stadium begins. The Dodgers encourage fans to carpool, arrive early and utilize transportation alternatives that serve Union Station and will connect them to the Dodger Stadium Express which will operate starting at 10:10 a.m. Please note the advisory from the Dodgers and the Los Angeles Police Department about parking and respecting the neighborhood surrounding Dodger Stadium. For more detailed information about parking and alternate transportation, click here. Fans that arrive early will enjoy hours of entertainment throughout the stadium. 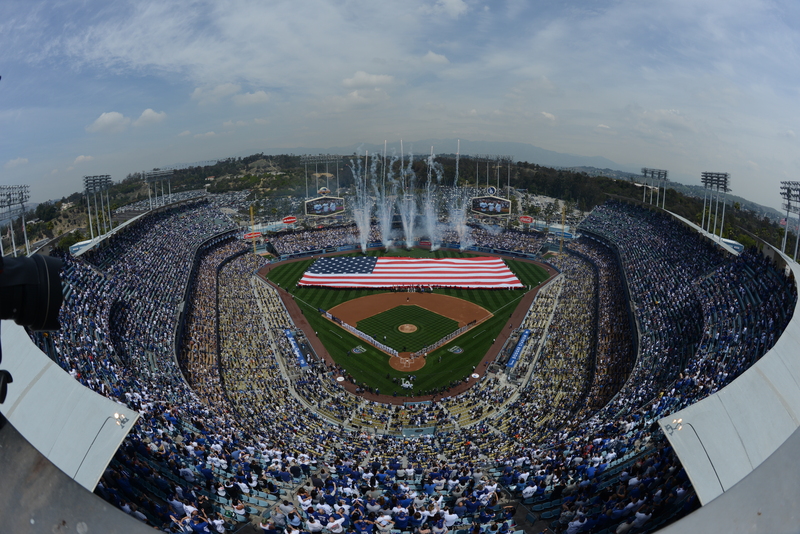 DodgerVision will present Dodger features leading up to the start of on-field ceremonies. Live music will be offered throughout the stadium from 10:30 a.m. to 12:30 p.m. Angel City Dixie Band will entertain in the left-field Reserve Level, a Real 92.3 DJ in the right-field Reserve Level, DJ ADM in the right-field plaza, a 102.7 KIIS-FM DJ in the left-field plaza and a MYFM DJ on the Top Deck. The Budweiser Clydesdales will also make a special appearance beginning at 10:30 a.m., making stops around the inner parking circle throughout pregame. Dodger batting practice is scheduled to run through 10:55 a.m., with Arizona taking batting practice then running from 11 a.m. until 11:55 a.m. On-field pregame ceremonies begin at 12:15 p.m.
Sam Harris, lead singer of X Ambassadors, will perform the National Anthem at approximately 12:50 p.m.. Representatives from the U.S. Army, Navy, Marine Corps and Air Force will present our nation’s colors. Members of the U.S. Armed Forces will unfurl a giant flag in center field. LADP Air Support Division will conduct a formation flight. Opening Day will then be highlighted by a special ceremonial first pitch honoring Hall of Famer Vin Scully, who is in his 67th and final season in the broadcast booth for the Dodgers. SportsNetLA Opening Day pregame coverage starts at 11:30 a.m. with “Lead-Off L.A.,” followed by “Access SportsNet: Dodgers” from 12:00 p.m. to 1:00 p.m. “Access SportsNet: Dodgers” will include live coverage of Opening Day ceremonies at Dodger Stadium. AM 570 LA Sports will be broadcasting live in front of the Dodger dugout from 9 a.m. to 12 noon with Petros and Money and Leeann Tweeden. For the sixth consecutive season, the Dodgers will pay tribute to the men and women of our nation’s Armed Forces by honoring a “Military Hero of the Game.” Opening Day’s Military Hero of the game is retired U.S. Army/U.S. Coast Guard sergeant Eddie Arambula of Torrance. Arambula joined the U.S. Army in 2002 and in March 2004 was deployed to Iraq in support of Operation Iraqi Freedom II. Arambula later joined the U.S. Coast Guard as Maritime Enforcement Specialist. In 2011, he deployed to Guantanamo Bay, Cuba, in support of Operation Enduring Freedom. Fan Service Stations are located in Field Level sections 52 and 53, Loge Level sections 152 and 153, Reserve Level sections 31 and 32 and Top Deck section 1 (between the Team Store and restrooms). Fan Services offers helpful information and services including first-game certificates, birthday buttons, the Anheuser-Busch Good Sport Designated Driver program, seat location wristbands to help prevent guests from getting lost, assistive listening devices, earplugs for guests and lost and found. Fan Service Representatives, uniformed in white polo shirts, will also be stationed at each gate throughout the season in order to assist guests with any questions. Fan Services can be reached on game day by calling (323) 224-2611 or by texting 69050 using keyword LADFAN followed by the guest’s location and comments. Is the game on TV? ?